After an exciting start which saw Rosberg, Hamilton and Alonso improve on their start positions, Vettel regained his lead and made a dash for it. Lotus said goodbye to the V8 engine in spectacular style when Grosjean was forced to retire due to engine problems. He wasn’t the only one to experience a sudden rejuvenation, Massa propelled himself from 9th to 6th at the start and continued past the struggling Mercedes into 5th. Desperate to toast his home fans and team at his last race for Ferrari before a move to Williams, he spent a fair few laps of the race dicing with Hamilton for 4th. 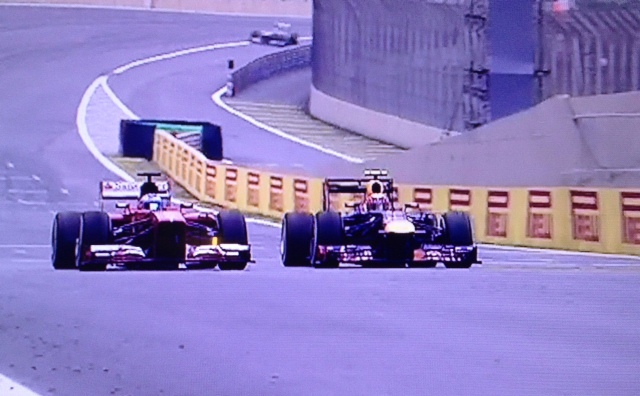 Their battle was prematurely ended when Massa was given a drive through penalty for crossing the pit lane entry. Champion for 15 seconds at the same circuit in 2008 Felipe was livid when the news was delivered by Rob Smedley. He showed his disgust to the stewards with a gesture and shake of the head. It did little good however and he managed to finished 7th. His team mate drove a strong drive, giving the fans one last bare knuckle duel with good friend and sparring partner Mark Webber. He occupied the third step of the podium. Giving Mark some much needed company in the green room and celebrating his first podium since Singapore. The Mercedes, after a blistering start from both drivers, experienced serious deterioration from the wet set up. Desperately hanging on for spots of rain which would improve the performance they irked every available inch of performance from the car until that rain arrived. When it did it was light spots, nothing to compliment the Mercedes set up. Rosenberg in damage limitation mode, unable to reclaim the places he had lost early on finished 5th. The unknown dry territory had left the cars exposed. 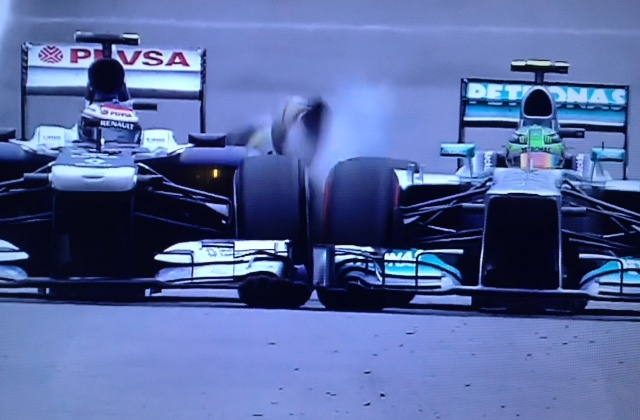 A clash between Hamilton and the William’s of Valteri Bottas left both cars with damaged rears, possibly miss reading the situation for tyre issues or anticipating a safety car panicked Vettel who dived into the pits seconds before Webber was due forcing the mechanics to swap the tyres. He lost a lot of time in the confusion but it was not as damaging as the incident was for Hamilton who was forced to make an unscheduled stop in his pits and was given a drive through for causing the collision. It was William’s who paid the highest price however as their race was ended. 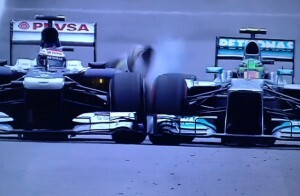 “It was not my fault that’s for sure” Valteri Bottas. The shunt gifted Webber third in the drivers’ championship, demoted Hamilton to 4th and he ultimately crossed the finish line in 9th. With his future still a seeming unknown, Ross Brawn could at least take some solace on the fact that the finishes did leave Mercedes second in the constructors championship 6 points ahead of Ferrari. Further celebrations echoed out through the Marussia garage as they finished 10th in the constructors, pipping Caterham to that coverted place and securing a much needed cash injection into the team for 2014. Pastor Maldonado’s last race at Williams narrowly avoided ending in a DNF for both cars when a tussle between himself and Torro Rosso’s Jean Eric Vergne resulted in a one hundred and eighty degree spin and some quick reflexes from Jenson Button. Mclaren, historically the most successful team at the circuit saw the recurring struggles and misfortune which has plagued the team all season put aside as both Button and newly released Perez claw themselves back into very respectable point positions from qualifying positions of 14th for Button and 19th for Perez. Button took 4th place whilst Sergio took 6th. Drive through was the penalty of the day and joining the group of Massa and Hamilton was Van Der Garde who received a drive through for ignoring blue flags. But none of this was enough to take victory away from Sebastian Vettel who sealed his 39th career win in record breaking style. 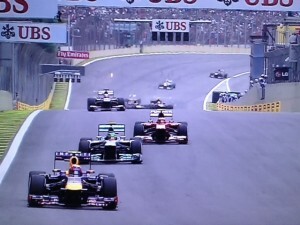 The win in Brazil was his 9th in a row and 13th in a season, equalling Alberto Ascari’s 60 year-old record. The Sao Paulo Grand Prix 2013 crowd were keen to hear from the quadruple World Champion but he did take a moment to pay a duty bound tribute to Mark and their achievements. A token which meant little to Webber as he joked with Fernando Alonso, possibly nursing a bruised ego after he slid across the podium whilst attempting to drown him in champagne. The Sao Paulo Grand Prix 2013 was a very nice way to see him end it. Full of the bare knuckle on track tussles we’ve been lacking of late. We saw previous heroes rise to the fore and witnessed a shake up of position. Most importantly we saw the enjoyment being injected back into the sport. 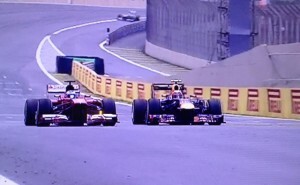 To see more F1 reporting from OSV, click here. Debbie enjoys: Spending time with her family and dogs, travelling and her work. Debbie has had exposure to every aspect of the business, ensuring a tight ship at every stage of the process. She thrives on achieving great results, all the while being a great person to laugh and joke about with.